This novel is part of a series that follows the adventures of Jacob. All through his childhood his grandfather has told him magical tales; tales that couldn’t possibly be true. After his grandfather dies he discovers that all those fantastical stories were true and his life is forever changed... This book is peppered with unusual photos. There were times throughout the book when I wondered why the photos were so integrated into the story because it occasionally felt a bit forced. Overall they added to the book and when I read the author interview included at the end it all made sense. In the interview Riggs talks about his passion for old photographs and how they inspired his stories. It turns out that the pictures in the book are genuine vintage photos! That little tidbit has made the series so much more interesting to me. I am reading the sequel now and I look forward to next photo appearing. 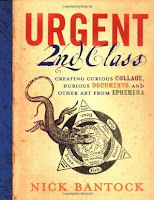 Urgent 2nd class : creating curious collage, dubious documents, and other art from ephemera by Nick Bantock. Another use for old photos and other ephemera like stamps, postcards, and envelopes is making art. Bantock’s book will show you different types of ephemera and how to use them to create your own unique art. It is full of photos which make it interesting to flip through, but it is informative too. Did you know that Austria was the first country to publish postcards? Thank you Austria! Speaking of postcards, this graphic novel is such a fun idea! Rodreguez created an anthology focusing on old postcards that he found in antique shops. He was so intrigued by the postcards and their messages that he wanted to give them stories. With the help of several authors he created this intriguing book of “true stories”. Each author was given a postcard and asked to give it a story. You get to see the postcard and enjoy the story it inspired. Forgotten bookmarks : a bookseller's collection of odd things lost between the pages by Michael Popek. In this book a bookseller documents the things that he has found in books throughout the years. I personally use any scrap of paper nearby as a bookmark when I am reading. I have a dislike of actual bookmarks because you have to remember where you put them. Not worth the effort in a world where there is always paper nearby. Obviously I am not the only one with this habit. I found it interesting to flip through this book and see some of the things that other people have tucked into their books.